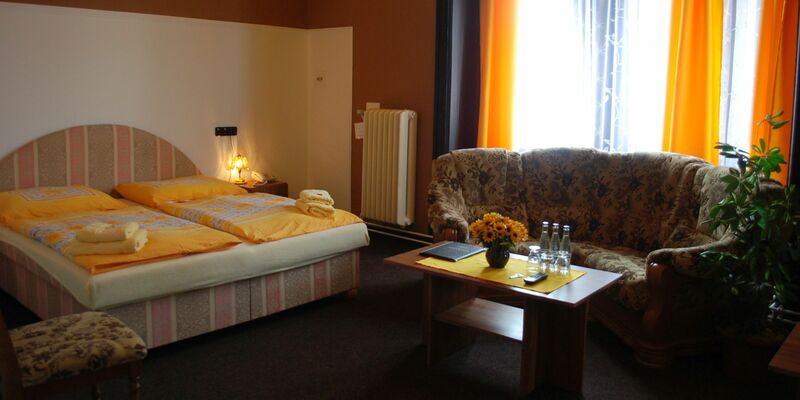 Room equipment: TV, fridge, electric kettle, bathroom with shower or bathtub and toilet. Room equipment: TV, fridge, electric kettle, bathroom with shower and toilet. Room equipment: TV, kitchenette equipped with stove, refrigerator, electric kettle, bathroom with bathtube and toilet. Room with two bedrooms, living room and kitchen. Room equipment: TV, kitchen equipped with stove, refrigerator, electric kettle, bathroom with shower and toilet. Breakfast are served at the hotel’s dining room on the third floor for an extra charge 100 CZK. Monday – Friday 9:00 a.m. – 9:30 p.m.
Saturday – Sunday 10:00 a.m. – 9:30 p.m.
All payments will be in advance if there is no prior agreement. The earliest possible check-in is at 3 p.m. if there is no prior agreement. The latest possible check-out is at 11 p.m. if there is no prior agreement. A small rooms cleaning of the rooms, emptying the trash bins and change of the towels is after every second night since the beginning of accommodation. Changing of the bed linen once a week. Persons who have not been registered at the reception and are in the room after 8 p.m. are considered as guests and must be registered and paid for them.